Strategy is a crucial part of leading and management, but it’s often overlooked, undervalued, or misused. 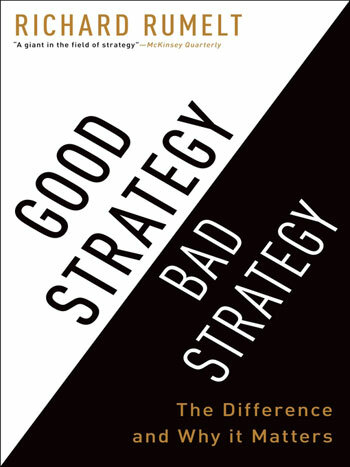 Richard Rumelt hopes to clear things up with his book “Good Strategy/Bad Strategy”. He gives us the three elements of what he calls the Kernel of good strategy: a) a diagnose of the current situation, b) a guiding policy, and c) a set of actions to carry out the policy. Within the book are vast examples of good and bad strategies. We read examples that go from the car industry to the 2008 financial crisis. Richard Rumelt has vast experience in strategy and is the best guide possible. I sure have learned a lot, and the kernel will help me devise digital strategies for my own projects.